The Fox Run Set of 6 100% Natural White Marble Stone Coasters are a gorgeous addition to your bar or living room and offer protection from drink rings. They feature a cork underside to also make sure your expensive furniture or countertops do not get scratched. These coasters comfortable hold wine glasses, coffee mugs, tumblers, you name it. 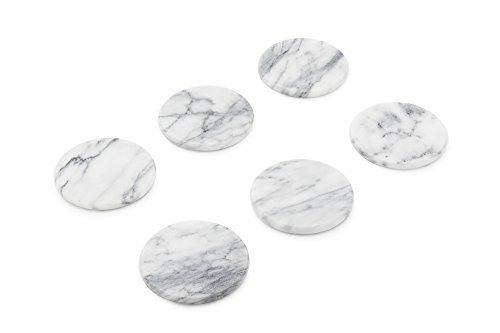 This set of real marble coasters makes the perfect wedding gift idea to your loved ones. Marble is the biggest trend in the home and also perfect for birthdays, Mothers Day, anniversaries, and more. VERSATILE: These coasters are made of high quality and polished marble, measure 3.5 inches in diameter and will comfortably hold any wine glass, cup, or mug. PERFECT GIFT: This set of real marble coasters makes the perfect wedding gift idea to your loved ones. Marble is the biggest trend in the home and also perfect for birthdays, Mothers Day, anniversaries, and more. EASY TO CLEAN: Highly polished marble coasters by are super easy to clean. They only need to be wiped clean using a damp cloth or rinsed using mild detergents and water.